Tasha Lawrence in A Doll’s House, Part 2 at Theaterworks. Photo by Lanny Nagler. The recent Broadway hit, Lucas Hnath’’s A Doll’s House, Part 2, is one of the hot tickets in theatres across the country this year, and Theaterworks Producing Artistic Director Rob Ruggiero has assembled the dream team of cast and creatives to bring the hit to Hartford, where it plays through February 24. I’m always wary of sequels and prequels, because there are so many bad ones in movies and TV, and so few in live theatre, other than those plays meant to be part of a double bill or trilogy. In musical theatre, sequels are often a kiss of death, as folks who sat through Annie II or Annie Warbucks, Bring Back Birdie, and A Doll’s Life know. 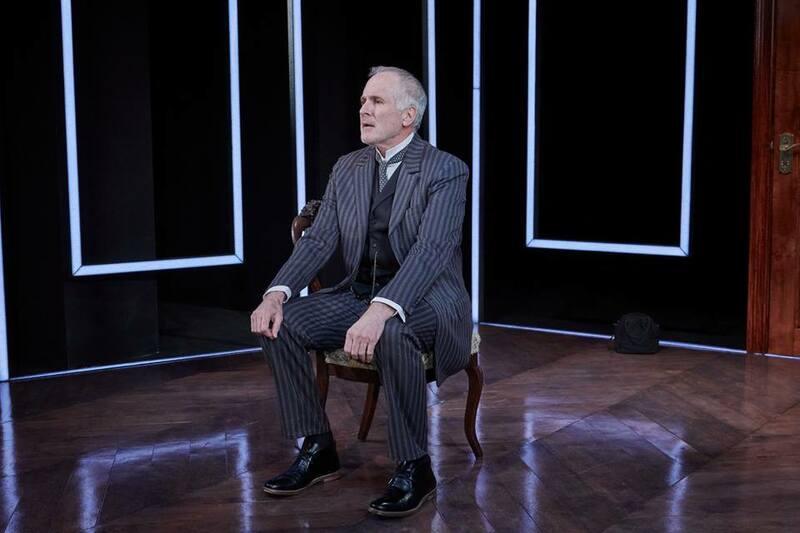 Sam Gregory in A Doll’s House, Part 2 at Theaterworks. Photo by Lanny Nagler. A Doll’s Life? That was the infamous musical flop produced and directed by Harold Prince, with script by Comden and Green, that lasted a handful of performances on Broadway in 1982. No one at the time sympathized with Nora, the heroine of the Ibsen classic, who slams the door on her perfect life as wife and mother, in search of something more. 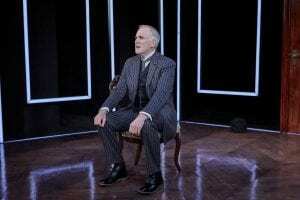 Flash forward to 2017, and Lucas Hnath’s A Doll’s House Part 2 tells Nora’s future story in a comedy that becomes a big Broadway hit, wins a Tony nomination for “Best Play”, and later becomes, according to American Theatre Magazine, one of the most-produced plays in the American theatre this season. Barrington Stage had a success with it last summer, and now, Theaterworks audiences have the chance to savor what might become an early 21st century classic. You don’t need to have seen A Doll’s House, Ibsen’s 1879 drama to appreciate A Doll’s House, Part 2. Before the latter production begins, Nora is married with children living with means in a male-dominated world where she is treated like a “sweet young thing”. Nora seeks self-fulfillment and independence, and she walks out on her husband and family to pursue life on her own terms, a move considered scandalous and shocking. 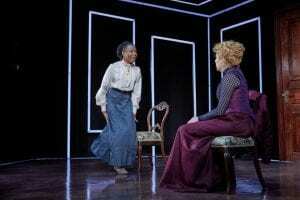 Kira Player andTasha Lawrence in A Doll’s House, Part 2 at Theaterworks. Photo by Lanny Nagler. So, in Hnath’s smart, often funny script, Nora returns to the old home after fifteen years. She confronts the husband she walked out on, her nanny who raised her kids after she left home, and her daughter. Nora over the years is successful and accomplished, and independent, but not totally free. In a taut 90 minute series of tough confrontations, she attempts to break the ties that still bind and forge ahead. Jenn Thompson, the director whose fresh takes on old chestnuts like Bye Bye Birdie and Oklahoma at Goodspeed have been so refreshing, stages A Doll’s House, Part 2, and she really brings out the best in Hnath’s very contemporary script in language and tone with undercurrents of Ibsen’s classicism. She’s got a fabulous creative team to work with. Alexander Dodge, the scenic designer whose Hartford Stage sets for Rear Window, Anastasia, and the current The Engagement Party, are jawdroppers, has created a purposely simple and angular set that is a showstopper in its stark simplicity. Alejo Vietti, who designed Goodspeed’s Holiday Inn and Barrington Stage’s The Royal Family of Broadway, has dressed the characters in sumptuous period costumes, complimented by Mark Adam Rampmeyer’s hair and wig designs. Philip Rosenberg’s lighting is purposely harsh. Tasha Lawrence’s Nora is tour de force, alternating between self-assured and vulnerable, and Sam Gregory gives a still-wounded portrait of Torvald. I really liked Kira Player’s performance as the daughter and Amelia White’s funny performance as the nanny. Hnath’s script calls out for strong actors, and this quartet fills that bill. Thompson’s staging brings out the balance in their performances. A Doll’s House, Part 2 is a fine start to the New Year at Theaterworks. And, if you’d like to see what A Doll’s House was all about, Theaterworks will present a staged abridged reading of the classic on February 10, staged and moderated by TheaterWorks’ Producing Associate Taneisha Duggan. Jenn Harris from Theaterworks’ Christmas On The Rocks, plays Nora, and Royce Johnson from TheaterWorks’ Broke-ology plays Torvald. Mark G. Auerbach studied theatre at American University and the Yale School of Drama. He’s worked for arts organizations and reported on theatre for newspapers and radio. Mark produces and hosts ArtsBeat Radio on 89.5fm/WSKB.